Well, the posts are just slowly trickling in, but trickling in they still are. Here are a few of my favorite pro graps cards from my collection for your approval. 2008 TNA iMPACT! 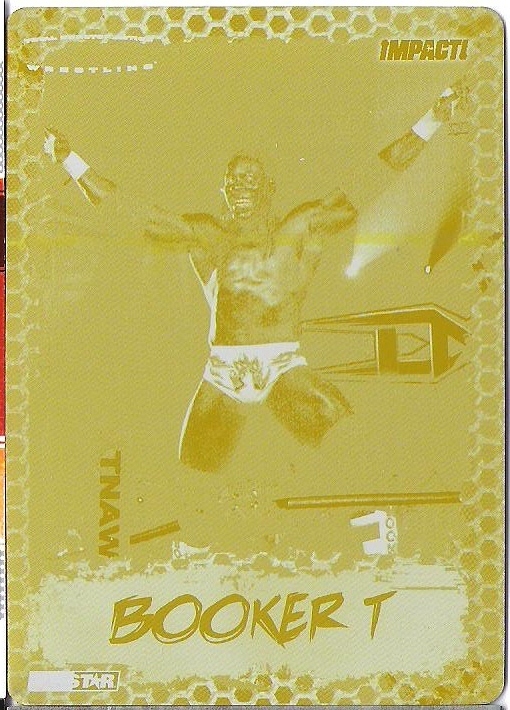 Booker T Yellow Printing Plate..
Booker is my favorite wrestler of all-time, and this is my best card of him. Despite having a lot of autographs (as wrestlers go anyway) out there, I’ve yet to come across one within my price range. The 6 (should be more like 10-12) time World Champion and one of the single most decorated champions overall in the history of professional wrestling blew my mind as a kid with his heavy, but not really martial arts, kick-based offense that’s never really been duplicated, and agility. He could fly a little too, with the Harlem/Houston Hangover, which is one of the coolest moves ever invented. He’s also being inducted into the WWE Hall of Fame, which is pretty cool too. It’s sad Eve left right when she turned in an absolutely amazing heel run (oddly similar in to the Batista’s run, in every aspect). I was down with Eve from her first televised match, which I just happened to catch even though I almost never get around to watching Smackdown! I want to say she was teaming with Maria or someone like her that had been there for quite awhile yet never really even became competent in the ring. Anyway, it was pretty amazing, because Eve was already immediately better than Maria or whoever it was that had been there so long from match one. So, aside from her stunning beauty, which according to my #WrestlingBros homey Alex* is even more disarming in person, I was pretty enamored that she immediately had more skills than the average WWE eye candy from the start. Her autographs are far, faaaaar more expensive than Booker’s, and the only one even close enough for me extend for got nabbed on COMC before I my money into paypal. 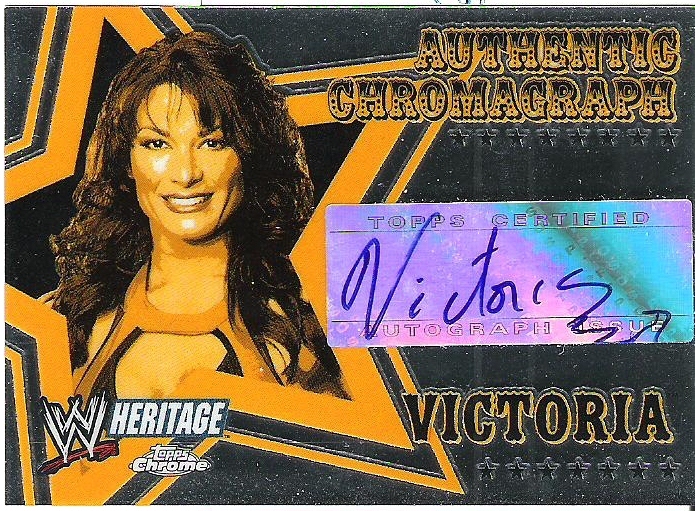 Tara/Victoria WWE Heritage Chrome Autograph. This was my very first autograph of my favorite Diva of the legendary Victoria/Trish Stratus/Molly Holly/Lita/Gail Kim era legit awesome wrestling. Good times. Her autos used to be a lot harder to come by before she made the jump to TNA and became Tara, and picked up several more in the $3-8 range in recent months, even a couple more WWE offerings. That said, when I got this way back when I felt super lucky to pick it up for a hair under $15 (not counting shipping, which I’m guessing was about normal). So why was she my favorite then and still remains high enough on the list to dedicate a binder page entirely comprised of hits to her? She was easily the toughest and most underrated of the bunch (only two title reigns over like seven or eight years, if I recall correctly), and the second best wrestler after Molly (at the time; Gail didn’t really get many chances to shine until the Knockouts division started up in TNA). I’m also way envious of my Chicago homies, because I want to go to her new restaurant!